Thread: Early Harwood & Co. The owner was looking for an early blade to add to his everyday rotation. The blade had lots of active rust to remove and removing the surface rust revealed some significant pitting on both blade faces and the spine. 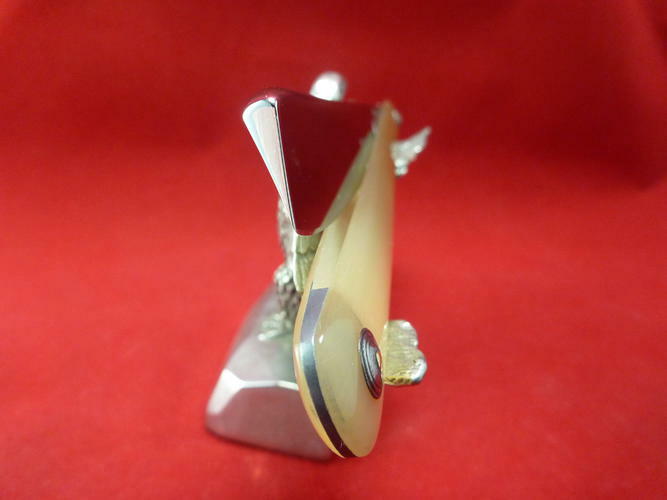 It was decided to restore the blade to its original crocus finish. 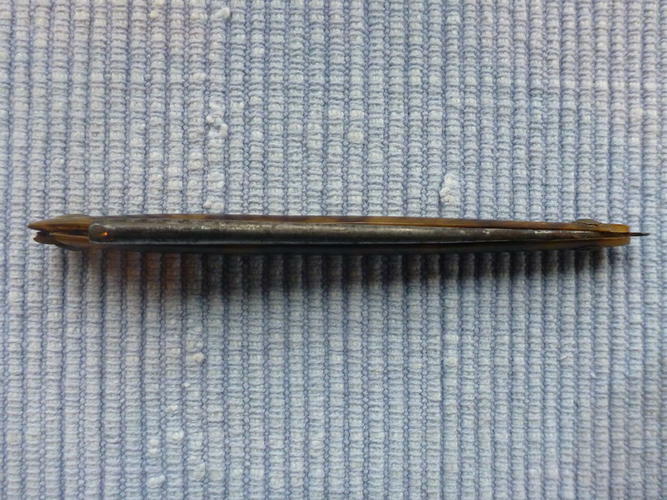 The scales were broken at the wedge end through the pin with pieces missing. Honey horn seemed an appropriate replacement. These are copies. I managed to save the original steel collar which were also corroded. I had to make a jig to hold them while I cleaned them up. They were very thin and fragile. The razor is pinned with brass as the original. Although I find these early blades a little awkward to hold on to this 6/8 wedge blade provided a comfortable shaving experience. I have no information on Harwood & Co. and I'm hoping Scienceguy will chime in with some information. The honey horn is nice and clear and anything that looks like delamination are just reflections from my poor photography. jabomano, Nightblade, nipper and 22 others like this. Saw that one on the bay and wondered what it would look like after restoring. Great looking resto, thanks for posting. karlej and cheetahmeatpheonix like this. It's a good looking razor. Excellent restore job. 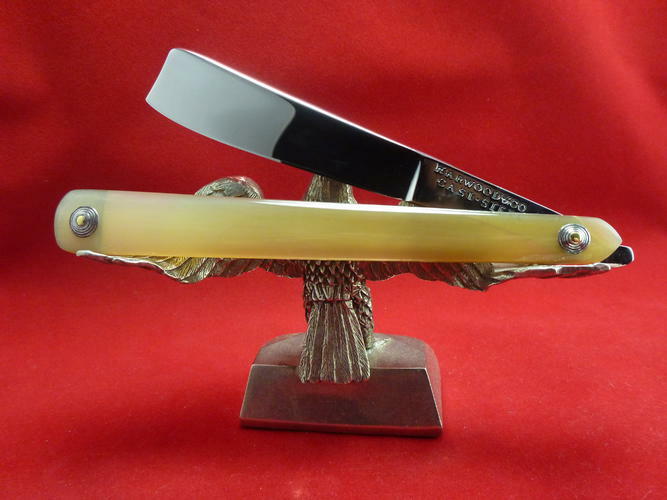 It is amazing that you were able to take that razor from its original state into a like new condition. According to research by Thorsten Sjölin, in July of 1799 a friedlische Rasiermesser (peaceful or pacific razor) was illustrated in a German trade journal and said to be a new idea from England. 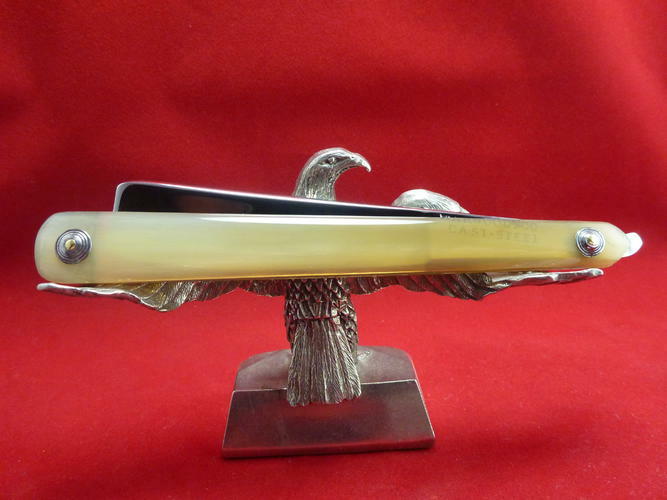 The razor was manufactured by Harwood & Co. in England and sold by Johann Christoph Roder in Leipzig, Germany. It was offered in a green-velvet-lined box together with a pair of leather strops, one black and one red, with the box fitted into a red leather case." 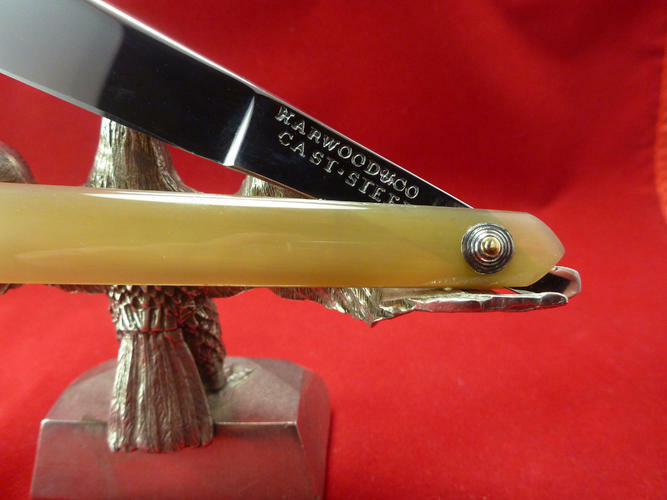 It doesn't really provide much info other than to illustrate that Harwood & Co. was likely an English manufacturer making razors as early as July 1799. I'll say it again. Very nicely done!!! sharptonn and karlej like this. The Universal British Directory (long name The Universal British directory of trade, commerce, and manufacture comprehending lists of the inhabitants of London, Westminster, and borough of Southwark), Vol. 4, published between 1795-8, lists Harwood & Co. as Sheffield cutlers. sharptonn, karlej, WW243 and 1 others like this. I'm going to go against the grain on this. I believe you did a great job but I don't think these early razors should be restored in this way. I've done it myself on one razor and I regretted it. The original scales could have been repaired and I think it's important to keep as much intact as possible. 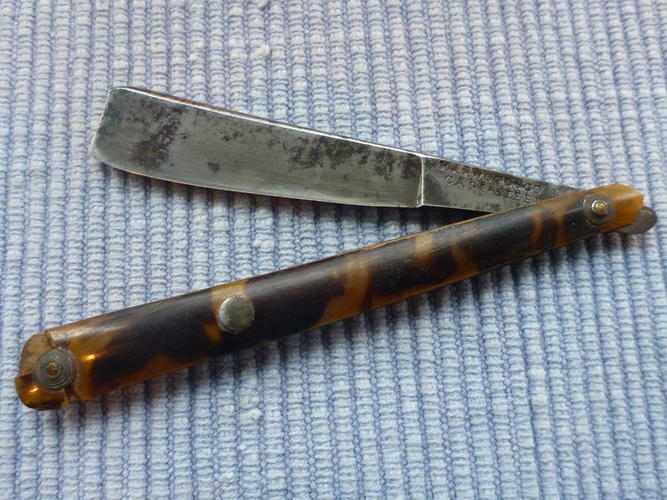 A 200 year old razor is usually going to show some signs of age and that's the fascinating part, signs of it's history. By buffing away the well earned patina, the history has been erased. JimmyHAD, karlej, Steel and 1 others like this. You are not against the grain at all. I'm sure there a many collectors that feel the same way. Scienceguy probably raised an eyebrow. 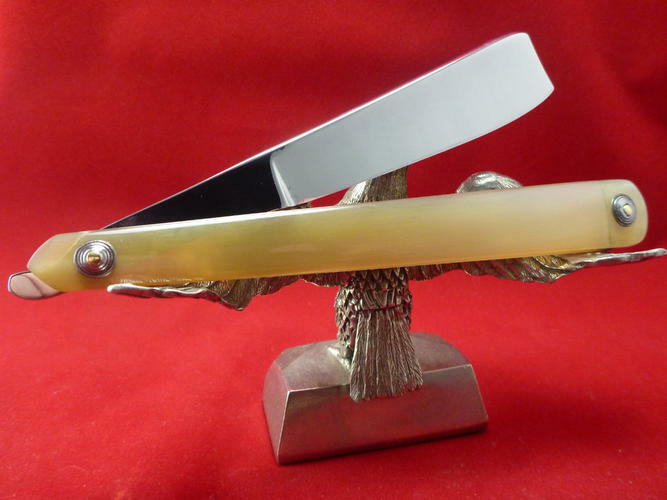 There are certainly fewer of these old razors out there than the say 1850+ blades. The razor was wanted as an everyday shaver and leaving it as is was not an option for that purpose. A minimal restore would have left a blade with many deep pits and at that point not original anymore. Some folks like to shave with razors like that because they have left some character on the blade and some do not like that. All serious considerations when restoring any of the 19th century blades. Each must decide for themselves. I new it would be controversial to post it. The conversation frequently comes up when restoring the old blades. How much is too much? Well some would say any. mattluthier, sharptonn, Wullie and 3 others like this.